Note: this is a rather long post that goes deep into exploring the mysterious world of fungi and their practical permaculture application. If you want a shorter, a more hands-on cheatsheet that you can print, fold and put in your pocket as you work on bringing the fungi back to your land click here. Think about the last time you were walking in an old growth forest. Remember that smell of the fresh forest air, the calming sound of birds, the serene backdrop of leaves gently swaying on the wind and the sun’s rays peeking through the lush canopy? Remember how with each step you took you could feel the twigs and branches crunching and your feet sinking into the soil sponge of old fallen leaves? Well, what you saw, heard and felt was only the half of the story. Underneath your feet there was a vast fungal network that has a mind of its own. It’s so pervasive that just the imprint of your foot, extending down into the soil, contains enough fungal cells to stretch 300 miles (480km!) if placed end to end. It goes mostly unnoticed, but you can see hints of this sentient network if you look under logs that are lying on the forest ground. The fuzzy, cobweb-like growths you can find there are called mycelium, a fine web of cells which, in one phase of its lifecycle, fruit the mushrooms that we all easily spot. This overall fungal network has been called nature’s Internet or the ‘Wood Wide Web’. Like the Internet it has a network-like design, where individual fungal cells merge together to form what Paul Stamets would call a neurological network of nature; a network that, like the human brain, is aware and reacts to change, but unlike ourselves, has the long-term health of the host environment in mind. 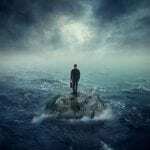 Today, with ever-increasing technological progress and deforestation, we are dismantling the neurological network of nature at an accelerated pace, and thus, in a sense, destroying our own life-support ecosystems. Sadly, we humans show little respect to the elders to which we owe our existence. In what way, you may ask? Keep reading, this will blow your mind. The kingdom of plants was, and still is, totally dependent on fungi. The first plants to make the transition from the sea to land some 450 million years ago did so without roots, relying totally on fungi to bring nutrients and water for growth. Moreover, as you’re going to learn today, millions of years later, most plants still rely on their fungal partners. Fungi are generally multi-cellular organisms with a nucleus and a single cell wall made of chitin, and, like all other organisms, they are on the constant lookout for the food. They obtain their nourishment by sending strand-like parts of their body, called hyphae, directly into their food, secreting chemicals to break in down into simpler molecules and then absorbing the juice directly into their cells. The body of a fungus is made of many such threads of hyphae, collectively called the mycelium. So, the mycelium is, in essence, a fusion between a stomach and a brain, it’s aware of its surroundings and responsive to changes in its environment as it searches for food. So, by selecting the microbiome of bacteria and other organisms in its surroundings, the mycelium network is creating the habitat and setting the stage for an ecological evolution. First, the selected microbes feed the plants, then plants feed the animals, and, finally, humans get the whole ecosystem services served up on a plate. That’s why, if you want to engage in any landscape regeneration, you’ll need help from fungi. In this post, you’ll learn how to work in harmony with them to establish your thriving food forest. We place fungi into four basic categories: saprophytic (decomposing), parasitic, mycorrhizal, and endophytic, all depending upon how they nourish themselves. But, there are some species that employ more than one strategy, making them difficult to categorize. Although parasitic and endophytic fungi play an important role in plant and ecosystem health, in this guide I will concentrate on the benefits of decomposing and mycorrhizal fungi, since we can cultivate them easily and understand them far better than the other two categories. Decomposing fungi are those we humans primarily cultivate. You are probably already familiar with many gourmet and medicinal mushrooms, such as shiitake, oyster, reishi, lion’s mane, and chaga, to name but a few. Very tasty and healthy indeed, thank you fungi! These fungi are wood decomposers and generally operate on the soil surface. So, when organic matter falls from the canopy of trees and plants overhead onto the forest floor, the decomposers that are in the soil and on the surface process this newly available food. From dead plants, these fungi recycle carbon, hydrogen, nitrogen, phosphorus and minerals into nutrients for living plants, insects, and other organisms sharing that habitat. They play a key role in the operations of soil food webs. Building soils is the primary outcome of the activities of these saprophytic fungi. They create brown rot, remaining of the wood, which acts as a nutrient sponge that holds a wealth of roots, microbes, insects, and water. Remember that sponge-like topsoil when you were in the forest? That’s it! In these relationships, the host plants supply the mycorrhizal fungi carbon-rich sugars – the product of plant photosynthesis – and, in return, the fungi decompose plant litter and soil pools (soil particles, rocks…) to help roots obtain the water and nutrients (phosphorus, nitrogen, trace minerals) that the plants require. As these fungi grow into the soil, their long-threaded hyphae extend in all directions, creating a fungal network that enables a plant’s roots to access 100,000 times more soil than it would be able on its own. All the plants that are in the local environment can tap into this mycorrhizal network, then the fungi mastermind the whole scenario by redistributing nutrients where they are most needed and even give plants the ability to communicate with each other via this biological communication network. Every plant that is involved in this mycorrhizal relationship is better able to supply its nutrients, withstand drought and other environmental stresses, root pathogens, and other diseases. Mycorrhizae also improve soil structure and give it porosity, aeration, water retention, and, ultimately, a platform for a diverse range of lifeforms. Mycorrhizal fungi are commonly divided into two groups according to how the fungal cells associate with plant cells, namely endomycorrhizal (the hyphae of fungi penetrate the cell wall) and ectomycorrhizal (the hyphae of fungi do not penetrate all the way through the cell wall). Now pay attention here, this is important, here’s what I mean. The endomycorrhizal (endo) type most often associate with the roots of vegetables, grasses, flowers, shrubs, and fruit and ornamental trees: some 95% of all plants in the world are compatible with these fungi. The largest functioning group is the arbuscular type of mycorrhizae (AM) and these AM fungi are the ones you’ll need for the roots of your fruit trees and shrubs. The ectomycorrhizae (EM) always work in partnership with woody plants, generally trees, primarily with conifers, but also some deciduous trees such as oaks. Only around 5% of terrestrial plants form ectomycorrhizal associations. Many of the EM fungi are mushroom-forming species, including highly prized edibles such as chanterelles, morels and matsutake, and truffles. These are the fungi you’ll need for your nut trees. The dream of a food forest and an abundance of food from a healthy, self-sustaining, low maintenance stand of trees and shrubs is impossible without fungi. No food forest is complete without our fungal partners. Our goal with a food forest is to imitate nature and how trees and shrubs grow in the wild. 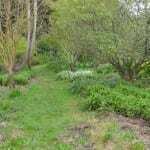 Currently, what most of us do is successfully imitate the structure of a forest edge with trees, shrubs and other perennials of varying heights planted in guilds. But, that’s only half of the story. What is as important as imitating the structure right is replicating what takes place in the forest soil with the fungi and the rest of the soil food web. While we won’t neglect the rest of the microbes, here we’ll primarily be focused on fungi, since according to Michael Phillips who wrote The Holistic Orchard, the food forest soil ideally contains ten times more fungi than bacteria. So, in the process of reintroducing the fungi to our land, we’re going to observe what nature is already doing and mimic, amplify and repeat it in our food forest and, in a sense, help nature reclaim what it lost. The quickest and easiest way to succeed in introducing the fungi into your soil is to use native fungi from your local ecosystem. Think about it, they are already there in your neighborhood and it would anyway be only a matter of time when they would arrive on your land – so why not give them a head start? But more importantly, as Peter McCoy would say, local strains of fungi show local resilience, and they are well adapted to your climate and to the habitat that’s teeming with competitors (remember the engineering the microbiome thing from the introduction?). By introducing them we are working with the natural tendencies of the land. Step 1. Do the site prep work, earthworks and covercropping in order to start creating favorable fungal conditions (shade, moisture, food). Step 2. Investigate your local forest and find sources of decomposing and mycorrhizal fungi you can use to inoculate your food forest soil. Step 3. Introduce the saprophytic fungi to your land to kick-start the fungal activity and soil creation process. Step 4. 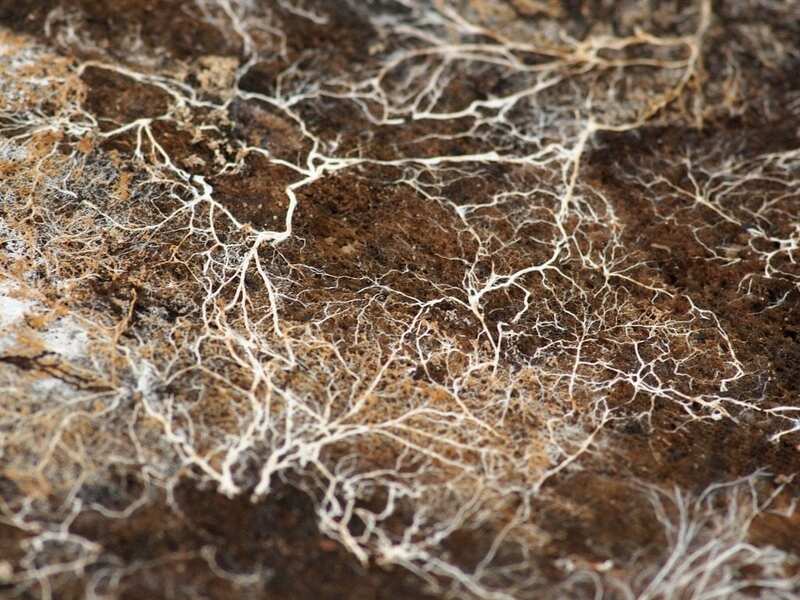 Introduce the mycorrhizal fungi to create a sentient underground network that will help your food forest plants to grow and thrive. Step 5. 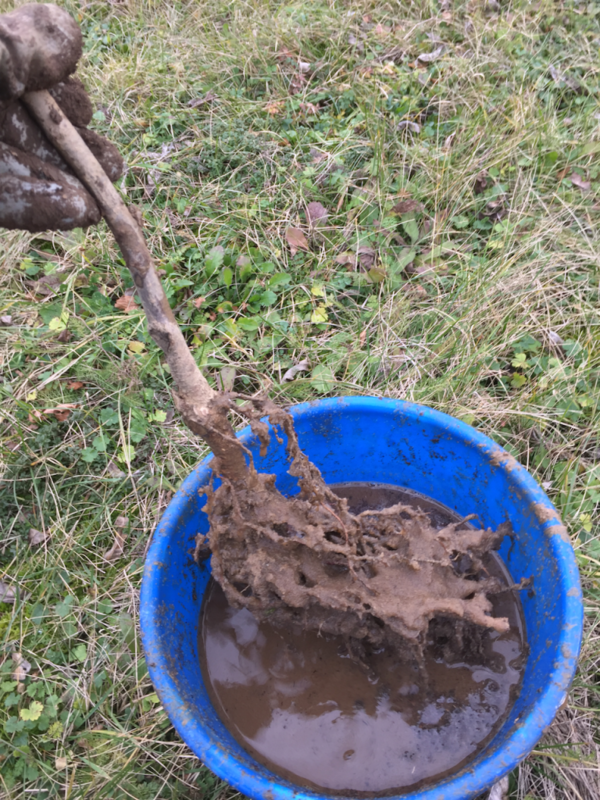 Make a compost tea from a healthy forest soil and spread it all over to bring other native microorganisms that will help fungi and plants grow. Step 6. Keep adding woody debris in the form of mulch, logs, and hugelbeds to feed the fungi and ensure good growing conditions. Download the free ‘forest fungi protocol’ cheatsheet. Just print it, fold it and put in your pocket as you work on bringing the fungi back to your land to improve soil quality. 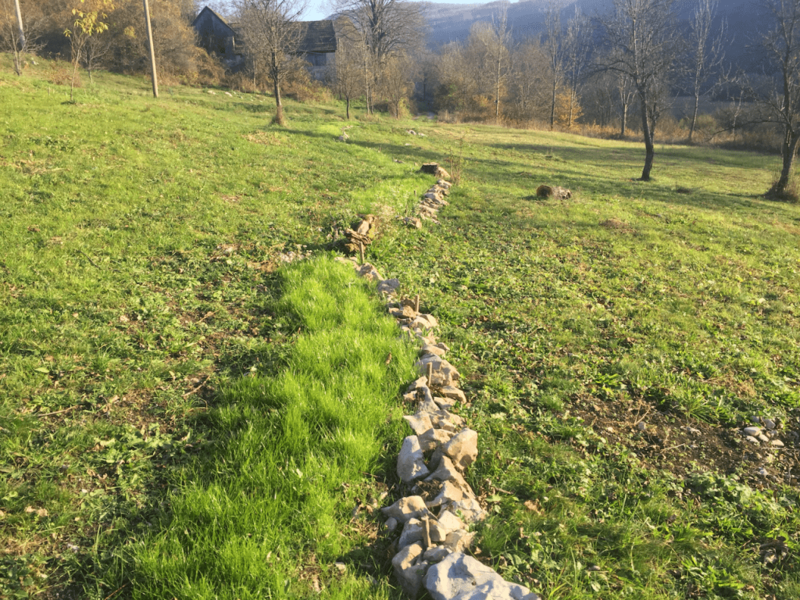 Covercropping (perennial rye and red clover) a swath for the tree-row-to be, these are the beginnings of my food forest. Now, depending on your site conditions, your overall fungi strategy might vary, but here I’ll just assume that you’re starting from scratch, with bare land, a pasture or, worse, a depleted cornfield. Bare land and disturbed soils are dominated by bacteria (if there is any biology left after the years of abuse that is) and you’ll want to start the transition towards a more fungal-dominated soil by creating a more fungi-friendly environment. Fungi need shade, air, moisture and food, and, even before they are introduced into the system, you want to start establishing favourable fungal conditions. At this stage, you can do that by earthworks (if necessary) and covercropping. Some sort of earthworks might be necessary to slow, spread and sink that water so it doesn’t just run-off to your neighbor’s place before infiltrating into the soil and fueling that fungi growth. If you can’t perform any earthworks, at minimum, what you can do is to set up some drip irrigation systems. Now, as you’re performing earthworks or some soil disturbance, what follows naturally when soil is exposed is the spreading seed of cover crops. Cover crops will help reduce the competition from unwanted plants, improve the soil and help with the fungal progression. So, following your initial soil disturbance, either by earthworks or just by tillage, stir in a mix of oats, red clover and tillage radish. This recipe comes from Michael Phillips’ new book the Mycorrhizal Planet and as he explains oats serve as a biomass and a nurse crop in sheltering the smaller clover seedlings, tillage radish increases soil’s organic matter content and drills deep to take up its share of the space between clover plants, while red clover fixes nitrogen and has a strong affinity for mycorrhizal fungi. The cover crops are here performing several important roles. By cutting or leaving them in place to decompose, we’re building organic matter and clover root systems are in place, improving the soil fertility and waiting for their mycorrhizal friends to arrive. Also, by introducing plants of various heights, we are creating favourable growing conditions for fungi above ground by providing shade, with humidity levels increasing nearer to the ground. 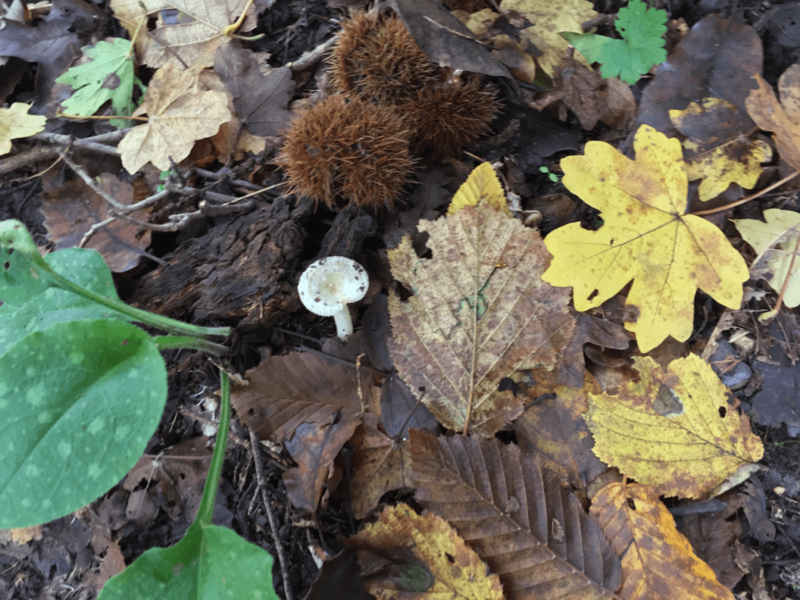 Going into my local forest and spending a day harvesting chestnuts and fruiting mycorrhizal mushrooms is a day well lived in my book. Okay, so now when you’re improving your soil and have to wait, use the time to go to your local or regional forest and survey it for native fungi species. These fungi and other resident microbes living in the soil are nature’s recommendations for your food forest soil restoration. Decomposing fungi are easy to find in a forest, almost anything that is on the forest floor is subject to these decomposition fungi. Practically any fallen tree or piece of wood that has been lying on the ground for a few months will host mycelium in it or on the underside and, in all likelihood, inside the wood. The mycelium of these fungi pulp the wood over time, slowly digesting its primary components, lignin and cellulose. Now, identifying mycelium without its mushroom is difficult, but you can be confident if you find a pile of decomposing wood on the forest floor and you dig into it, you’ve found your decomposing fungi spawn. 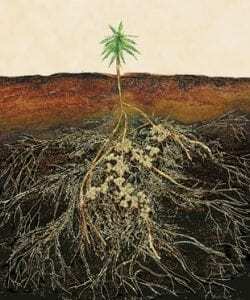 Mycorrhizal fungi are soil fungi. While we might find their mycelium beneath fallen logs, or indeed in piles of leaves or wood twigs and chips, to be sure you obtain your mycorrhiza you need to look for specific types of plants and geographic locations that might have these symbiotic fungi. Here, we again have to make a clear distinction between endo and ecto mycorrhizal fungi, since each are more suitable for symbiosis with different type of trees. The roots of fruit trees are considered to be entirely endo; arbuscular (AM), while nut trees are mostly ecto (EM), so that’s why we can’t just grab any type of mycorrhizae. For your AM, the ones for your fruit trees, there’s no better place to go and find your appropriate inoculum than healthy fruit trees in a wild setting. If you can’t find a wild fruit tree, a forest-edge ecosystem with berries, goldenrod, meadowsweet, and the like will feature a diverse mix of suitable fungi. Unlike AM fungi, most EM fungi, the ones for your nut trees, reproduce sexually, via fruiting bodies: mushrooms, puffballs, and truffles, making them easier to spot and obtain the spores and wild spawn. To find your sources of ectomycorrhizal fungi, look for a healthy stand of big old hardwood or conifer trees, think deciduous if your nut trees will shed leaves, and think coniferous if your nut trees are evergreen. If the mushroom conditions are right you’ll probably find fruiting mushrooms there. If not, then simply scraping the ground, again some 4 inches (10 cm) deep, will provide you with hyphae fragments. Finally, you’ll also find your healthy living soil containing other soil food web microorganisms in this stand of big old healthy forest trees. This is the soil that hasn’t been disturbed for a long time. Just a few scoops of this soil should be enough for making the compost tea later. Okay, so in the last step you’ve found your sources of decomposing fungi in the nearby forest, and, as discussed, almost anything that is on the forest floor is subject to these decomposition fungi. By bringing this decomposing wood (logs and branches) that’s infused with wild spawn and fruiting mushrooms onto the site, you’re actually inoculating your site with decomposing fungi and starting to rejuvenate your land. You see, in forested land, after catastrophes strike, the saprophytes (the decomposing fungi) lead the way toward renewal by supporting the construction of complex life-supporting soils. These fungi decompose and recycle dead wood, building humus and freeing up nutrients locked in the wood, making them available to the rest of the soil food web – bacteria, protozoa, insects, plants, animals, and mycorrhizal fungi. By recycling woody debris and creating the soil, these pioneering fungi are setting the stage for all other subsequent generations of organisms. Once other organisms enter the landscape and they become engaged in the soil, nature will steer the habitat on the path toward self-healing. According to Paul Stamets, the best saprophytic fungi for helping an injured (forest) ecosystem recover are turkey tails, woodlovers, oysters, garden giants, and psilocybes (yes, magic mushrooms!). If, like me, you’re living in a temperate climate, then these will be your go-to decomposing fungi species. They love bacteria and attract them as these mushrooms start to fruit and they grow with so much vigor that they suppress any unwanted parasitic invaders by occupying their niche, thus protecting and benefiting your food forest growth. Saprophytic fungi growing in the wild are some of the easiest to recognize and transplant. The only problem is acquiring enough of the woody debris that’s infused with mycelium. Obviously, there is a lot of debris in the woods, but you’ll need piles of the stuff. What I do is, every time I’m the forest gathering my firewood, I make a huge pile of leftover branches, cut through the pile multiple times with my chainsaw to make them smaller, more digestible and quicker to decompose, and then leave them there on the floor to become ‘infected’ with fungi for at least 2 years. After a while, the pile will decompose, the branches will start to crumble, and you’ll obtain your perfect inoculant filled with saprophytic and even mycorrhizal fungi. Once you have the mycelium of the saprophytic fungi on your site, it’s all about giving it a new, friendly environment – something I’ll discuss in greater detail in Step 6. Before that, however, let’s introduce mycorrhizal fungi and the rest of the forest flora and fauna. Dipping hazel roots into an ectomycorrhizae spore-rich slurry. The best time to introduce your mycorrhizal fungi is during planting. Okay, so now you have decomposing fungi working the surface, decomposing the woody material, kick-starting the fungal activity, and paving the way for the rest of the fungi and microbes. Now you should start introducing the mycorrhizal fungi into the soil to create that sentient network that will help your plants with an increased uptake of nutrients, resistance to drought, and resistance to root pathogens… All that good stuff you are not otherwise getting. These fungi can make up as much as 50% of the microbial mass in a given volume of soil. Their presence not just helps plants to thrive, but it also greatly improves the soil organic matter content, soil aggregation, aeration, and drainage. Let’s now look at the different ways of introducing these fungi to your food forest, again paying special attention to AM and EM fungi, since they connect to different types of trees: AM with fruit trees, EM with nut trees. The easiest way of transplanting mycelium is to simply scoop it up from your “secret location” in the forest and move it to your food forest. If you place the transplanted mycelium, so-called virgin spawn, into contact with the right mixture of materials, they will regrow, expanding the colony. Again, AM and EM have different preferences, so make sure to match them to fruit trees and nut trees respectively. It really doesn’t take much soil to introduce these hyphae fragments into the ground back home. Michael Phillips recommends one scoop of soil duff per tree or shrub will do, whether that’s at the time of planting or tucked near roots beneath a recently mulched tree. This is a method for inoculating your nut trees with EM fungi, and it’s relatively easy for a beginner. Here, you simply collect the fruiting bodies, such as mushrooms, of EM fungi from your nearby forest and use it as propagules, either by using its spores diluted in water or the whole fruiting body. So pick your mushrooms, remove the spore-bearing surfaces from the fruiting bodies, crush them, and immerse in water and some clay. Thousands of spores will be washed off, resulting in rich inoculum for your nut tree seedlings. A spore-mass slurry from a single mushroom, diluted in a 5-gallon (20 l) bucket of water, can inoculate a hundred or more seedlings. Hint: you can also use the same slurry to inoculate your seeds. Tossing spores using water as a carrier on the ground above the root zones of an already established tree is another method that takes little time and effort. Moreover, if you really can’t be bothered with making the spore slurry, the simplest, but maybe not the most effective, way of inoculating would be to simply cut the fruiting bodies into small pieces and mix them into the soil when you’re planting your trees. In this method, which admittedly requires a bit of practice and knowledge, you’re going to cultivate the AM fungi. Put simply, you’re going to take the soil containing spores or the mycelium you found in the wild, grow it in a pot throughout the season and then harvest the roots and the mycelium at the end of season. These colonized root fragments are the inoculant you apply the following year to your fruit trees. Since AM fungi are generalist, and associated with the vast majority of plants in the world, you don’t need any expensive tree nursery type of operation to cultivate them. You simply take your soil containing wild spawn or spores of AM fungi, mix it with compost and vermiculate, and add non-woody perennial host plants such as bahiagrass or annual rye. These grasses are ideal, because they develop fibrous roots that fungi can colonize and they aren’t winter-hardy. Therefore, if you prepare your pots in springtime, and allow enough time for fungi to colonize the roots, by wintertime you’ll have your colonized root fragment ready to harvest plus the perennial grasses will die off once the winter chill strikes them. You can find the whole procedure for On-Farm Production of Inoculum of Mycorrhizal Fungi from Rodale Institute here. Your healthy food forest soil requires the presence of the whole soil food web. Fungi are an integral part of it, and they are keystone species, but the picture is not complete without bacteria, protozoa, nematode, microarthropods… The role and function of all those organisms is important when it comes to nutrient cycling and growing plants. Okay, up until now in your food forest you should have decomposing fungi on the surface and slowly expanding mycorrhizal network underground, now let’s see how to bring other organisms into the mix. Fungi are at their most animated when bacteria join the food forest party but, overall, we can say that, the more diverse the food web, the more diverse the fungal diet, and thus the healthier the soil. You don’t have to go far or think too much about where you’re going to find this massive diversity of microorganisms that your plants and fungi need. Instead, you’re simply going to use the healthy forest soil you found in Step 2 and make yourself a compost tea out of it. Think of a compost tea as liquid fertilizer and an inoculant. By brewing and spreading compost tea across your site and around your planted trees, you’ll be inoculating the ground with the indigenous microbes and help fungi and plants grow. This is a simple, yet brilliant means to further distribute diversity and help nurture your food forest. Making compost tea requires a compost brewer. 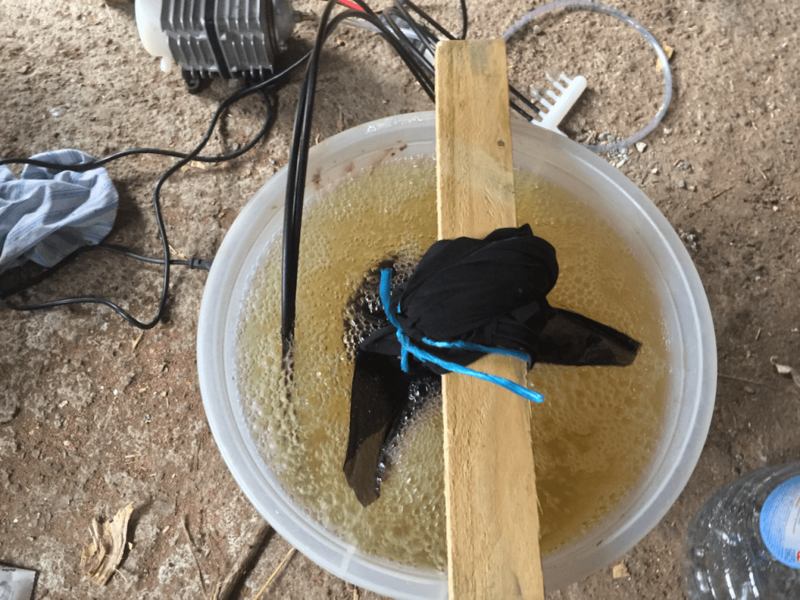 In short, if you want to make an aerated compost tea, you’ll need some sort of a bucket, an air pump, a mesh bag for containing the forest soil, and a food source for your microbes (humic acid, seaweed, fish hydrolysate, molasses…). You fill the bucket with water, place the mesh bag inside, turn on the pump, and add the food source. This then starts the process of aeration and multiplication of the micro-organisms. Once you’re done, wait for 24h and you’ll have compost tea that’s ready to be applied. To learn more about how to make compost tea, I recommend that you watch this video. Also, don’t forget that you can grow your own fungal compost from this forest soil. This way you be ensured of a perfect inoculum of indigenous organisms and an almost endless supply of composted soil for the compost tea. Step 6. Keep adding woody debris in the form of mulch, logs and hugelbeds to feed the fungi and ensure good growing conditions. 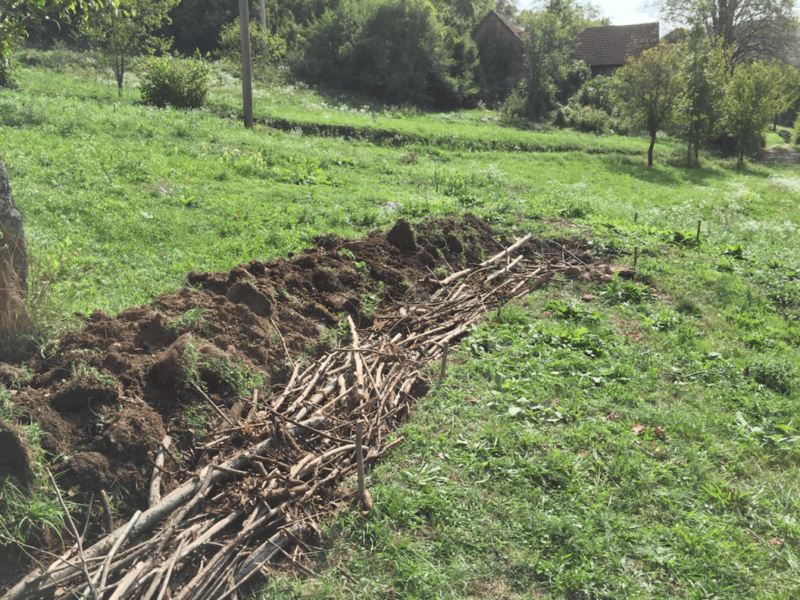 Building some hugelbeds…My recommendation is just keeping on bringing woody materal and pile it up within the tree row. Now you’ve come full circle, In Step 1 you started with creating a fungal-friendly environment with cover crops, and we’ll now close the loop in this step. The primary goal with early covercropping was to get more organic matter in place (food and nutrients for fungi) and to prep the soil for trees and their mycorrhizal partners. The secondary goal was to create a microclimate of shade and increased moisture for the decomposing fungi that live on the surface and other fruiting mycorrhizal mushrooms. Perennial grasses, with their long vertical shoots, provide shade right above the ground, and the stems act as conduits for collecting condensation, sending water droplets to the soil level where mushrooms like to form. 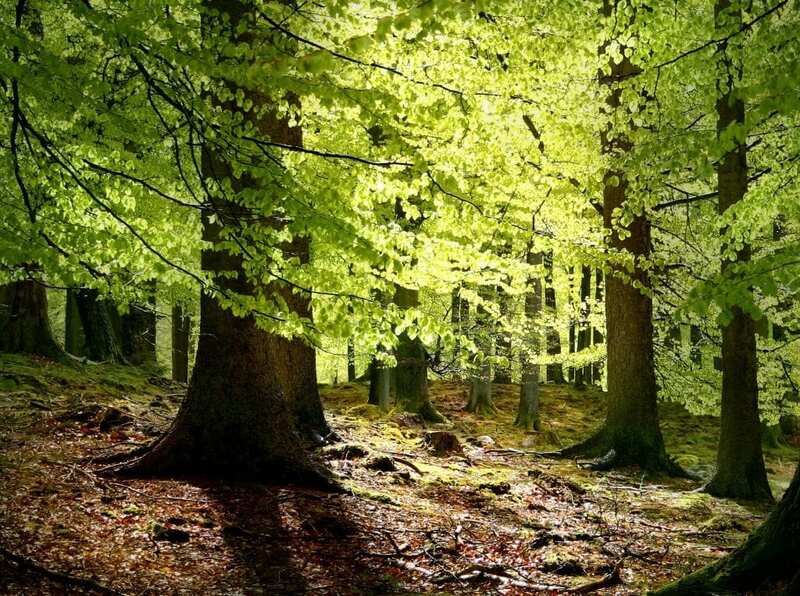 Now that we’ve introduced the decomposing and mycorrhizal fungi and the rest of the resident forest micro-organisms, it’s time to keep feeding them and promoting the environment they need to flourish. You can keep up cutting your cover crops and leave them to decompose in situ but that’s not enough for fungi, for them to grow you should keep adding woody debris in the form of wood chips, logs and hugelbeds. Our goal is to create fungal duff, that litter layer where mineralization and humification take place. In essence, you want to emulate the forest floor conditions with natural twigs, logs and leaf fall all around. This is what fungi need in terms of both food and those favourable conditions of shade and moisture. Now, whether you use whole or fragmented wood is going to affect the rate at which nutrients return to the soil. For example, wood chips are quickly consumed by fungal mycelium, whereas logs decompose much more slowly. But you want both, and in-between, variably sized fragments will let mycelium quickly grab and invade the wood and act as mulch, and wood fragments with greater surface areas are more likely to have contact with spores or mycelium and also can be buried underground. First the mulch layer: the ideal mulch, according to Michael Phillips, is the ramial chipped wood, i.e. twigs of wood that are less than 7cm in diameter coming from deciduous trees and woody shrubs. This is going to be the main course for feeding mycorrhizal and saprophytic fungi and a great means of creating the increased shade and moisture conditions they need. You can put down anywhere from 2-8in (5-20cm) deep of these woodchips and create “shade” for fungi and of course suppress unwanted competing plant species. Suffice to say, young trees will love you for helping them to reduce the competition from weeds. Nonetheless, be careful not to go overboard and pile mulch too deeply, as this suffocates aerobic fungi, the fungi we’re trying to grow. Now with your log layer on the surface, it’s hard to go overboard, just keep bringing logs and bigger branches from the nearby forest, or use the leftovers from maintaining your food forest and getting the firewood. 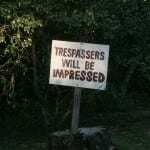 Just be careful not to obstruct your access within the food forest. Also, burying logs or woody debris and thus creating hugelbeds is a great way to promote fungi growth and soil creation. This creates substantial pockets of organic matter where fungi will prosper for years. The wood in the soil is like a sponge and acts as water storage. This is incredibly important in drier periods but, overall, fungi and other microbes need moisture for the decomposition and their metabolism. So conditions for all sorts of fungi are ideal, and, over the ensuing years, fungi will digest the wood and provide a constant source of water, nutrients, and warmth to plant roots. With that, you’ve provided the fungi with their food and favourable conditions so that they can flourish and ultimately help you have that low maintenance abundant food forest you always dreamt of. Using fungi as a tool for ecological restoration is a relatively new concept borrowed from the age-old methods of nature. Today, we know that the strength and health of any ecosystem is a direct measure of its diverse fungal populations and their interplay with plants, insects, bacteria, and other organisms. 1. We started the whole process by having the right conditions in mind. Fungi need shade, moisture, and food, and we’ve started to create these beneficial conditions for both the fungi and the trees with some earthworks and covercropping. 2. We found local strains of fungi and other microorganisms in the nearby forest that you can cultivate and use to inoculate your food forest soil. You don’t have to reinvent anything, just do what nature does and use what nature would in your local ecosystem restoration. 3. First, we introduced the saprophytic fungi to your land; these are easiest to recognize and transplant (think fallen logs in the forest). The introduction of these pioneering fungi will begin the soil creation and trigger a cascade of activity by other organisms. 4. Following this, we introduced the mycorrhizal fungi to the system, whether by using wild spawn, spores, mushrooms or cultivated root fragments. Once in the ground, these fungi will improve the soil and help your plants grow and distribute the nutrients and water where they’re needed the most. 5. Next, we introduced the fungi we made a compost tea brew to bring other symbiotic organisms that will help fungi and plants grow. 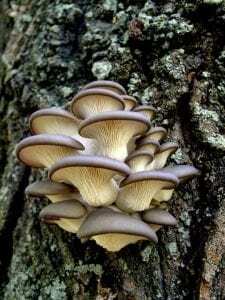 Fungi will grow better if you bring the rest of the forest soil microbes, especially bacteria. The most effective way of doing this is brewing some compost tea and spreading it all over the place. 6. Finally, we continue to promote the fungal environment with woody debris. 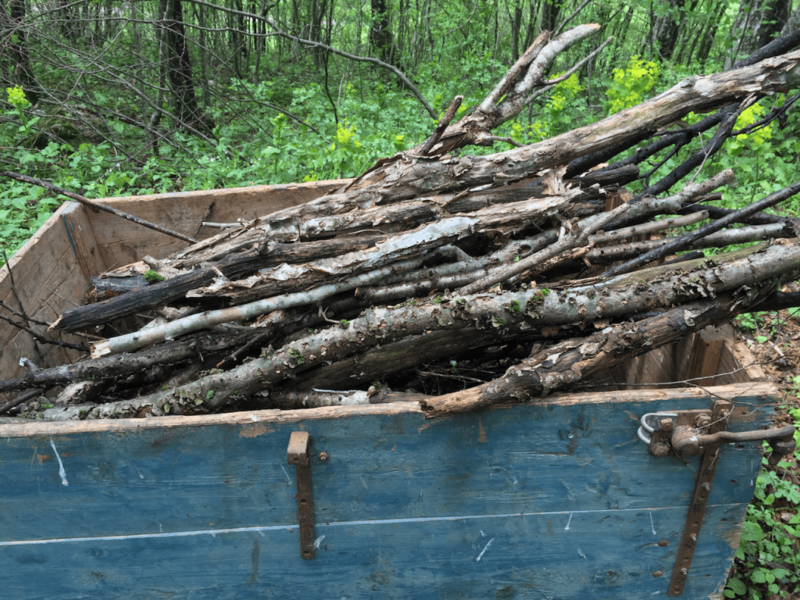 With everything in place and your food forest growing you need to keep adding woody debris in the form of wood chips, logs, hugelbeds if you want to keep the fungal biomass growing. There you have it, that’s how you work in partnership with fungi to help your food forest grow! Let me know what you think about the protocol in the comments section below.